*printer is not yet fully activated. This Old Mill Mountain Home was opened in Nov. 2005 and is nestled on a mountaintop, in the beautiful Laurel Branch area, near Waldens Creek Rd. It has three elegantly decorated levels with one king, two queens and two sofa sleepers (sleeps 10). Featuring two electric fireplaces, three baths, each is accessed from the bedrooms. Memorable views from every deck. Hot tub on the deck with a great view of its own and a full-size pool table for your entertainment pleasure. For the family with differing tastes, this Mountain Home also has six HDTV flat screen televisions, including one in the game area. Location is always important so know this cabin is located just 6 miles from Pigeon Forge, off of Wears Valley / Waldens Creek Road. Like being at home away from home. Clean and lots of room. Best cabin we’ve ever stayed in all the years we have come down to the smokies. Great layout and beautiful views. The mountain home “Laurel View” was a great place to stay for our party of eight. It wasn’t too far from the main strip in Pigeon Forge (about 10 min or so) and just a short distance from Gatlinburg. Our main objective was to bring our older sister back to Pigeon Forge/Gatlinburg before she wouldn’t be able to enjoy it. She is mentally handicapped and is starting to have a hard time getting around. The front steps to the home were a little difficult for her, but with the handrails she was able to get up and down them. There was a bedroom, bath and convertible bed on each floor, which gave us plenty of choices for sleeping. However, there weren’t sheets available for each of the convertible beds. The mountain home was enjoyed by all including the hot tub and pool table. Having the convenience of a washer and dryer was great as we always pack light. This would be a terrific place to stay if you have a large family or with several couples. 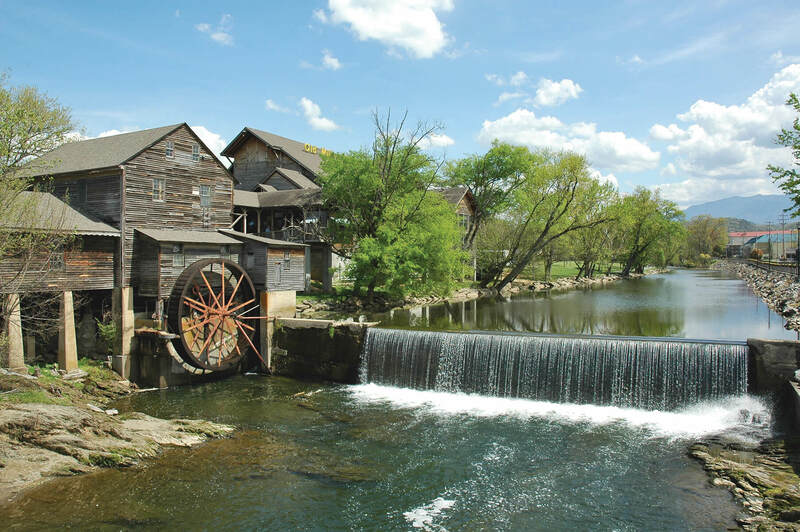 It’s close to both the strip in Pigeon Forge and Gatlinburg, and there are plenty of things to do in both places to keep you busy for days. We had a great time staying at Laurel View and would definitely stay her again or another place through Old Mill Lodging. The cabin was much more than I ever expected! The kitchen was well stocked with everything we needed. There was plenty of towels in the bathrooms and extra sheets and blankets. The new sofa in the living room was awesome! I loved the amazing view from the decks. Check in was super easy and I would rent this cabin again. We stayed here over Spring Break. There were 6 of us. The cabin had plenty of room and was very clean. They included; coffee, paper towel, toilet paper, two packets of laundry soap, dishwasher soap, plenty of towels, wash clothes, etc. They have flat screens in each room with Xfinity cable, and internet. The hot tub was wonderful to sit in at anytime and look over the beautiful mountains. The view is wonderful, however all views do face other cabins. We didn’t mind as we didn’t spend a whole lot of time on the deck. It’s about a 15 minute drive to Piegon Forge and about 20-25 mins to Gatlinburg. The drive to Gatlinburg is beautiful. We experienced a lot of traffic each way, I assume that was due to it being Spring Break. We didn’t mind the drive. The drive up to the cabin is extremely steep and can cause some motion sickness. The management company was very easy to work with and very friendly. I found the price of the cabin to be reasonable and would recommend it. The place was great. The pictures did not do it justice! The view of the mountains was beautiful. We will definitely be coming back in the future. We came with 3 moms & their daughters for a girls weekend & everything was wonderful! The unit was clean, peaceful, and had gorgeous views. It was close to the parkway (15 min drive) yet far enough that we could come back & relax peacefully. My family recently reunited in Pigeon Forge and stayed at Old Mill Lodging. Even though everyone was not able to make our bi-annual reunion, those of us who did, had a wonderful time. What helped to make our reunion so enjoyable was the the mountain home, Laurel View!. It had a magnificent view of the Smoky Mountains. We so enjoyed having our morning coffee setting on the porch swing overlooking the view. (whenever I would look for my husband, that’s where I would find him……on the porch swing, swinging.. That was amazing to me, as he is a man who never sits still!) I especially appreciated the fresh bedding that was provided for all the beds. They were hotel quality. The cabin accommodated family members so they could have their privacy when not all together. The new grille was great!. The decor of the cabin was perfect! We were even entertained (while sitting on the porch swing) by a family of raccoons climbing up the railings to the second floor deck of the neighboring cabin looking for food. (we then understood the caged garbage containers on our deck.) Working with the staff at Old Mill Lodging (Dee & Kelly) was a pleasant experience. They helped guide me in my decision making throughout the reunion planning process. Kelly answered all my questions with a great deal of patience. We would definitely select Laurel View again when returning to Pigeon Forge. Our experience was wonderful in every way. Thank you Dee and Kelly. This was our First family vacation together with 4 generations…. We had a great time. Everything at the cabin was WONDERFUL..Everyone enjoyed themselves and the cabin was Excellent.. Nice and Clean and everything worked wonderful no problems what so ever.. The area around the cabin is so pretty and hardly any bugs out during the evenings which was really nice because we love to sit outdoors alot and drinking coffee in the mornings on the porch rocking was wonderful.. I think I will always want to go back to either that cabin or another one with your Ole Mill Cabins. I would highly recommend this property and will return again. The property was clean and well maintained. The photos of the property were accurate with exception of the breath taking views. Actual views were better than photos. We visited Pigeon Forge and Dollywood when were not relaxing at the cabin.